Automatic refills whenever you need them. When you call, you speak to a person. When you fill with AHF you help your community. With AHF Pharmacy, you will fill better. We are honored that you have chosen AHF Pharmacy and our Specialty Trained staff to be one of your partners in the management of your healthcare needs. We are a not-for-profit healthcare provider and 96 cents of our earnings go back into providing services to our patients and the communities we serve. We provide specific, personalized services in partnership with you, your provider and others that may be involved in your care. Our services are customized to all your pharmaceutical needs and be convenient for your living conditions and life style. Our 24/7 Customer Care Line is staffed by seasoned AHF Pharmacy Employees that can assist you with resolving questions regarding your medication or unresolved grievance issues that you may have. We tailor delivery or pick-up based on your requirements. Our dedicated team will ensure the delivery of your routine monthly medications. We provide special packaging and systems to help you remember which medication to take and what time of day to take it. We are available 24 hours every day of the year. Services are provided without discrimination based upon race, cultural background, age, nationality, gender, or insurance coverage. Our pharmacies can provide services to all 50 states and have no geographical restrictions based on location within any state or city of the United States. We are currently expanding into Puerto Rico with an AHF clinic and pharmacy as well. All services are provided by staff employed by AHF. None of the services we provide are “outsourced” including after hours calls, computer services, clinical and dispensing services, to name a few. Our staff members have experience with various cultural aspects of specialty healthcare. Many of AHF Pharmacy team members are bi-lingual. In addition we provide a “Language Line” service for over 100 languages. Our Pharmacy staff includes Pharmacist, Technicians and Nurses that are specialty trained, with oversight and consultation from the AHF Chief of Medicine and AHF provider staff. All are specialty trained and have National Certifications in their specialty area of expertise. This ensures that the health information that we obtain to help you with your condition is a collaboration between your healthcare provider and the multi-disciplinary team at AHF. We are constantly reviewing current healthcare information regarding common conditions, diagnoses, treatment and interventions and is “Evidence-Based”. 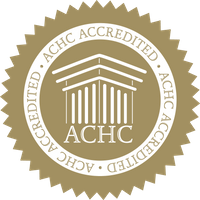 We are accredited by ACHC as a Specialty Pharmacy Services and Infectious Disease Specific to HIV. Our pharmacists are certified by the American Academy of HIV Medicine and have track record of excellence in HIV care. 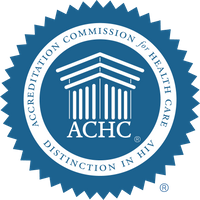 We are accredited by ACHC as a Specialty Pharmacy Services with a Distinction in HIV. We are all accredited by ACHC as a DMEPOS provider to dispense diabetic supplies and nebulizers (Medicare B).